← The Kansas City Renaissance Festival Experience As A Vendor Sucked. With Christmas coming faster than you can imagine, I will start posting my hand-made items here. 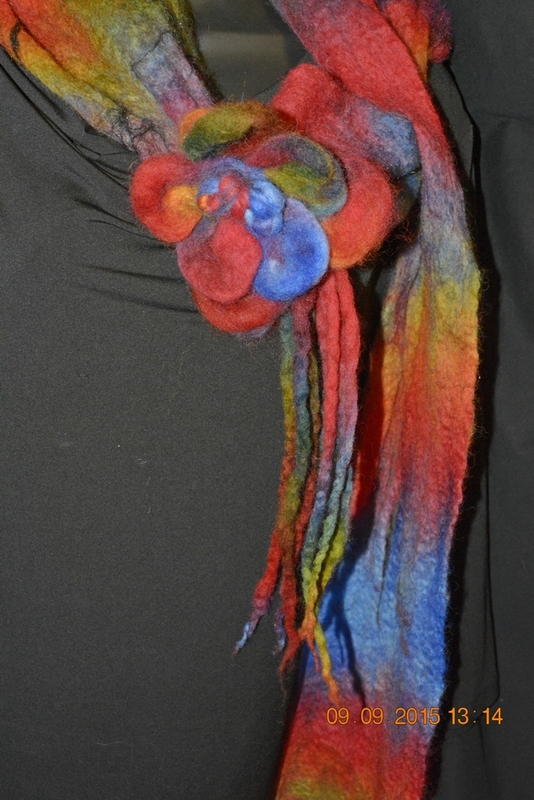 This is a very special, hand-dyed, hand-felted wool scarf. I created a special, decorative flower of the same wool as an accent. I cobweb-felted the wool along with some black firestar for sparkle. It is a very long scarf – over 80 inches in length. The width varies a bit from 7 to 8 inches. It is a very lightweight scarf, but will keep you quite warm. Handwash in cool water and very mild soap, then you can drape it over your shower curtain to dry. This is a unique piece. There will never be another one like it. It is $125.00, shipping included. If you are interested, please let me know in the comments, and I will send you a PayPal invoice..
80 inches long by 7 to 8 inches wide. $125.00 includes Priority Mail Shipping within the USA. This entry was posted in Castle Argghhh Creations Available, Cobweb Felted Wool Scarf and tagged blue, Castle Argghhh, cobweb, green, handdyed, Handfelted, orange, red, scarf, Wet-felting, wool. Bookmark the permalink.